"I Dated a Robot", originally titled "J-Lo Dolly", is the forty-seventh episode of Futurama, the fifteenth of the third production season and the fifteenth and last of the third broadcast season. It aired on 13 May, 2001, on Fox. It guest-stars Lucy Liu as herself in a jar as well as robot versions of herself. Fry downloads Liu's personality illegally onto a "blank robot", and they start dating. The discontent of the others leads to an investigation, which reveals the sinister nature of the corporation providing the celebrity personalities. 1.1 Act I: "I want to see the edge of the universe!" 1.2 Act II: "On to the internet you go!" 1.3 Act III: "Humans dating robots is sick!" 1.4 Act IV: "Bender don't bend that way!" 1.5 Act V: "Massive corn clog in port seven!" Act I: "I want to see the edge of the universe!" The crew is watching The Scary Door, Fry enters to try to convince them that the future is far better than his time. They decide to do (almost) everything Fry ever dreamed of. After blowing up a planet, travelling to the end of the universe and riding a dinosaur, Fry decides the last thing he wishes to do is to be romantically linked with a celebrity. Act II: "On to the internet you go!" Fry and Leela go online and locate nappster.com, where Fry chooses to download Lucy Liu. The download is successful and Fry falls for the Liubot. Act III: "Humans dating robots is sick!" The crew considers the relationship sick. They try to make him end the relationship, and show him a propaganda film which shows that humans dating robots will lead to disaster. The film has no effect on Fry, who is busy making out with the Liubot. Leela, Bender and Zoidberg head off to shut down nappster.com, where it is revealed that the company (secretly known as kidnappster.com) is holding various heads in jars hostage in order to scan them to create the robot duplicates, Liu having been there 800 years. The three rescue Lucy Liu's Head and escape. Kidnappster sends Liubots to kill them. Act IV: "Bender don't bend that way!" The real Lucy Liu is apparently attracted to Bender. A swarm of Liubots begin attacking. They hide in a movie theatre, where they find Fry and his Liubot on a date. The swarm enters and continues its rampage. 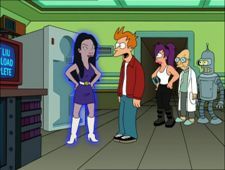 Fry leads Bender, Leela, Zoidberg, Lucy and his Liubot to the projection room. The Lius prepare to enter through the window, but are stopped by a huge quantity of popcorn, until the swarm begins shooting the popcorn back. Act V: "Massive corn clog in port seven!" Fry's Liubot sacrifices herself to destroy the others and save Fry. Bender and Lucy admit their feelings for one another, much to Fry's disappointment. This episode features its title. Pamela Anderson's head is now at kidnappster, having last been seen helping Mom's sons in "A Fishful of Dollars". Other celebrities being held captive included Cheech Marin, Harrison Ford, George Michael, Nicole Kidman and Madeleine Albright. Some of Fry's dreams are destroying a planet, seeing the edge of the Universe, riding a dinosaur, to be invisible in a chocolate factory, and to date a celebrity. The idea of love between a robot and a human being wrong as it does not produce children (as said in the propaganda film) refers to the sometimes argument put forward by those opposed to homosexuality. The title for this episode was close to being "J-Lo Dolly", though it remains unknown why the crew changed their minds so late in the progress or whether the original title had implied an appearance by Jennifer Lopez, commonly known as 'J-Lo'. The new hands that Fry buys later turn out to be the cause of his inability to play the Holophonor. The song played during the montage is "Love Machine" by The Miracles. Another song by The Miracles, "I Second That Emotion", was used as the title of 2ACV01. Fry: Oh, well, I don't care if it was some dork in a costume. For one brief moment I felt the heartbeat of creation, and it was one with my own. Leela: They're forming a human pyramid of robots! Fry: She's more than just a piece of software. Fighting Liubot: I am Lucy Liu give me your spines! Liubot: I'll always remember you. [Robotic voice.] MEMORY DELETED! Lucy Liu returns in "Love and Rocket". While there are currently only the two alternate universes, many parallel ones come into existence in "The Farnsworth Parabox" (which is also the fifteenth episode of its season). Bender refers to robosexuals in "Space Pilot 3000", it is possible that this is a reference to a romantic relationships between a human and a robot as seen in this episode. Bender later develops a robosexual relationship with Amy Wong and is a key player in the passing of Proposition ∞. Lucy Liu parodies her successful Charlie's Angels movies, reprising her role in the 2007 classic Charlie's Angels III: The Legend of Charlie's Gold (which features a vampire and an explosion). The title is based on City Slickers II: The Legend of Curly's Gold. A large focus on the copyright infringement issues causing problems for Napster. "We would have gotten away with it too, if it weren't for those meddling adults!" - similar line (with kids instead of adults) is found in most episodes of Scooby Doo. "Nightmare at 20,000 Feet" - Smith's "there's a gremlin destroying the plane, you gotta believe me!" Fry and the Liubot visit Dinkin' Donuts, which refers to the doughnut chain Dunkin' Donuts and former New York mayor David Dinkins (whose picture is on the store marquee). At one point, Bender acts in the manner of Archie Bunker from All in the Family and even sits in Archie's trademark living room chair. When Leela, Bender, and Zoidberg prepare to leave Napster with Lucy Liu's head, George Michael's head responds, "Please pick me up before you go-go". A reference to the Wham song "Wake Me Up Before You Go-Go". The "3-Eyed Jack's Casino" may be a reference to the One Eyed Jacks casino in Twin Peaks. The jar holding Lucy Liu's head seems to change sizes between scenes for the last act. It goes from being roughly the size of Bender's compartment when he tosses Pavarotti to make room for her, to being slightly smaller than the compartment when Lucy gives Fry the speech about illegal downloading, to being larger when Bender's holding her next to him after Fry erases the last Liubot. After the Liubots tear through the cinema screen, the exact same scene that had just happened is shown, albeit blurred onscreen. However, this may just be to make fun of the repetitive nature of the film.